I adore red cabbage cooked in this way and it makes a change from serving it shredded and stewed. 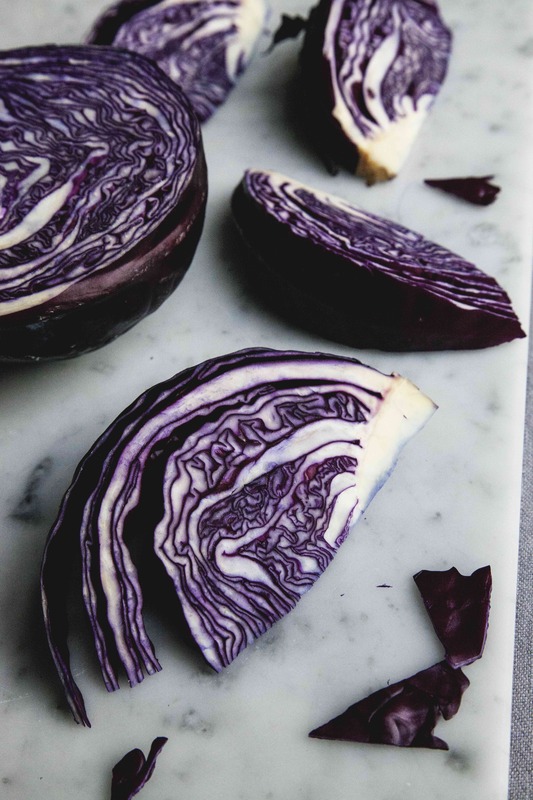 First, cut the cabbage into wedges, you can appreciate the natural beauty of this vegetable and it also allows the edges to crisp, while the insides remain juicy. Make sure everything is well bathed in oil, especially the herbs which will become crunchy and brittle in the heat of the oven. The colours of this dish are so deep and warmly wintery. 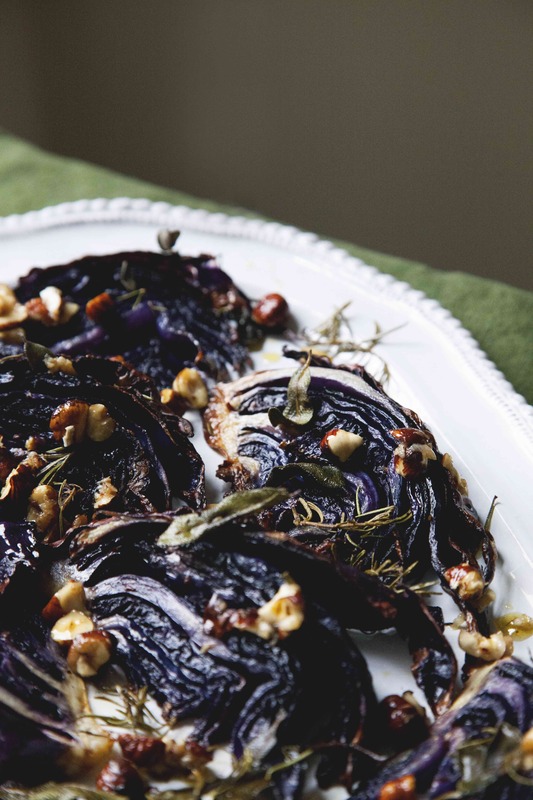 Serve beside some simply cooked greens or with a slice of white goat’s cheese for some contrast. 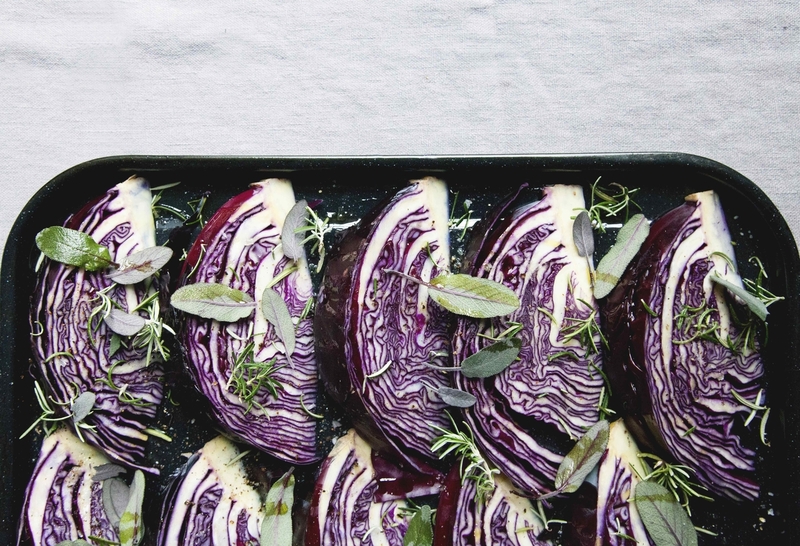 Cut the cabbage into narrow wedges and lay on a baking tray without too much overlapping. Brush with oil on both sides, season well with salt and pepper and scatter with the herbs. Pour a little extra oil over the herbs. Roast for about half and hour until the cabbage is starting to look brown and slightly crisp then carefully turn the pieces over and continue to cook until the same thing happens on the other side, about another 15 minutes. Test by pushing a knife or skewer into the thickest part of the rib to make sure it starting to soften, but retaining a little crunch. Make the dressing by roughly chopping the hazelnuts and mixing with the other ingredients. Season well with salt and pepper. 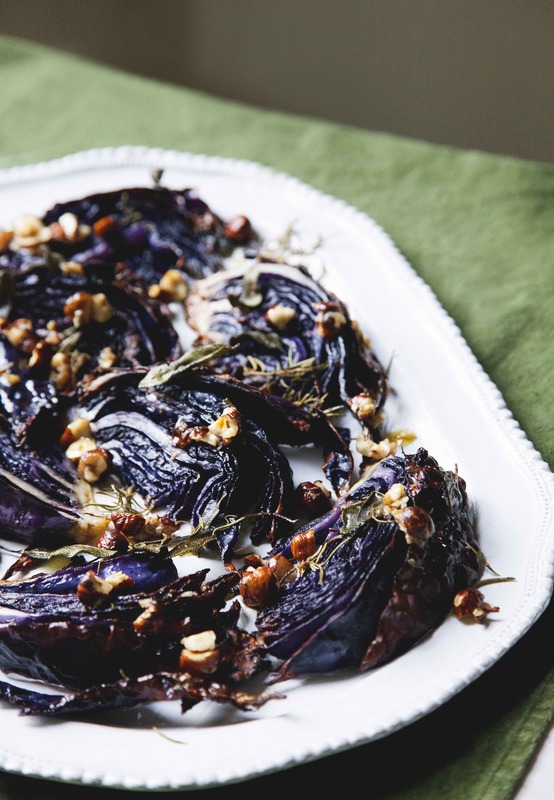 Arrange the cabbage on a serving dish with all the crisp herbs any scrapings from the baking tray, then spoon over the dressing and allow it to soak in for a few minutes before you eat.